Financial Advisors, who communicate in a manner that educates, inspires and influences clients, develop strong client relationships and enjoy success second to none. If you are ready to step up and take your verbal skills to that level of sophistication, this one-day exclusive workshop with Don Connelly is for you. Find out what traits and habits Elite Advisors share – like honesty, authenticity, listening and connecting with people on an emotional level, to name a few. Learn how to establish trust early on in the relationship. Acquire the knowledge to make yourself irreplaceable and priceless in the eyes of your clients. Understand why affluent investors focus on your EQ, not your IQ. Make the first steps to becoming a master at building and telling stories in a style that best suits you. Start using analogies to keep your message simple. Get started on building an effective bear market presentation. At the end of the workshop, you will have all the tools you need to become an effective communicator who educates, inspires and influences prospective and current clients just like Elite Advisors do. 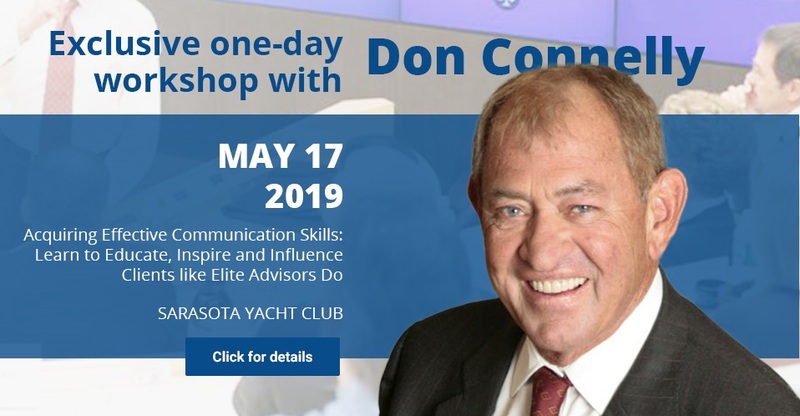 This workshop will be held on May 17, 2019 at the prestigious Sarasota Yacht Club, one of only 7 “Elite Club of the World” awarded yacht clubs in the country. Because Don Connelly wants you to receive personal attention during the retreat and to leave it with the confidence to step up to the next level, this retreat will be limited to no more than twenty-five Advisors. Reserve your seat now while there are still available seats. Visit the event page for a video message from Don Connelly with details about the workshop, full program for the day, testimonials, and more. Dinner with Don Connelly and Rebecca Saggau at the Yacht Club on Friday evening after the workshop. Some bonus materials like the mp3, How to Excel in the Securities Industry or its CD version ($89 retail value), discount codes for other products and services available on Don Connelly’s websites, and more. You must send an email to info@donconnelly.com to receive a confirmation of your cancellation. Cancellation requests received prior to April 27, 2019 will receive a 100% refund. Cancellation requests received between April 27, 2019 and May 6, 2019 will receive a 50% refund. Cancellations received on or after May 7, 2019 will not receive a refund. Substitutions/name changes may be made at any time prior to the event without penalty.